New Zealand’s only commercial organic tea grower, Zealong, and U.S. based food distributor, The Kiwi Importer, have just released Zealong's new Heritage Tea Collection into the U.S. The Heritage Collection is uniquely Zealong, a nostalgic interpretation of the age-old favorites: Breakfast, Grey, Chai, and Chamomile. 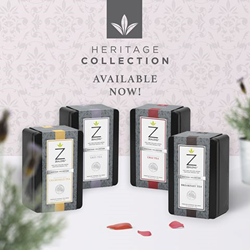 In true Zealong style, everything about the new Heritage Collection has been thoroughly considered from the combinations of the tea’s organic flowers, herbs and spices; to the non-GMO eco-friendly tea bags made from plant starch, and the reusable collector’s tin. The four Heritage blends are complex and layered. Reminiscent of the flavor origins yet distinctive of their New Zealand roots and Zealong’s world class tea. The Heritage Collection is offered alongside Zealong’s award winning Origins and Botanicals Collections. Zealong is one of the very few tea companies in the world to hold ISO22000 HACCP certification - the world's highest food safety standards. Their traceability system can identify batch specific teas by day, block and processing method which far exceeds industry standards. Zealong is also certified and audited by Swiss Consultancy SGS, the world's leading inspection, verification, testing and certification company. The purity of Zealong tea is unsurpassed.